But to Jonah this seemed very wrong, and he became angry. All children who grew up in Sunday School would have learnt of the story of Jonah – I dare say most children would have done some art and craft with the fish and Jonah inside of it as well. It’s a story well-known and very popular in children’s bibles, and there’s such a fairy-tale effect in the way Jonah was eaten and spat out by the fish that it has always been a great bedtime story. Yet, the story of Jonah that we hear as children usually stops at the point where Jonah repents and goes to Nineveh and did as the Lord commanded. Children are spared the confusing emotions of this very volatile prophet and his very symbolic actions as he waited outside the city. It wasn’t less dramatic than him being swallowed by the fish, but it didn’t have that fairy-tale effect. Jonah was a very dramatic person, to me at least, and his story a very dramatic one. Then again, many of the prophets had dramatic – or tragic – lives. In this study, we will examine the character of Jonah in the aftermath of God’s forgiveness on the city of Nineveh and explore the reasons behind his anger. We all know Jonah – he’s regarded as a minor prophet due to the length of the book – it must be said that the book of Jonah starts abruptly but ends even more so suddenly. We were not told about the background of Jonah, or where he serves or what he was doing before this ‘random’ mission that God has given him. First he flees – and thanks to him, the name Jonah is synonymous in many cultures today for being a coward; then he got thrown into the sea, and a fish swallows him. He lives in the fish for three days, got spat out, and went to perform the mission that God has given him – prophesy the destruction of the city of Nineveh to the Ninevites. The Ninevites actually listened to him, repented, and God forgave them. There was no destruction – not in his time, at least. And Jonah was angered. That was precisely why Jonah didn’t want to go to Nineveh in the first place – Isn’t this what I said, Lord, when I was still at home? That is what I tried to forestall by fleeing to Tarshish. I knew that you are a gracious and compassionate God, slow to anger and abounding in love, a God who relents from sending calamity [Jonah 4:2]. He was a Hebrew, and a prophet. The Ninevites were his enemies, they were Assyrian, who always sought to oppress and persecute the Jews. He was also a prophet – a man of God who walked closely with God and hears from the Lord directly. If there is a job description for a prophet, it must be to prophesy. And when a prophesy fails to come true, the prophet can only be a false prophet. From a human perspective, Jonah would perhaps be justified in not wanting to go to Nineveh and prophesy their destruction. Can you imagine his heart as he prophesied to them? It must have been complicated – wishing for them not to listen, wishing for them not to repent, so that they would truly be destroyed and his prophesies would come true and his people freed from their enemies; yet at the same time speaking out loudly and confidently because it is God’s will for them to listen. In essence, the result of the matter was clear – Jonah’s mission wasn’t just to go to Nineveh to prophesy their destruction. His true mission was to save them from destruction. And that was something Jonah didn’t volunteer himself for. Not of his own volition, he had somehow ended up as the ‘saviour’ of his enemies. How infuriating it must have been for poor Jonah. 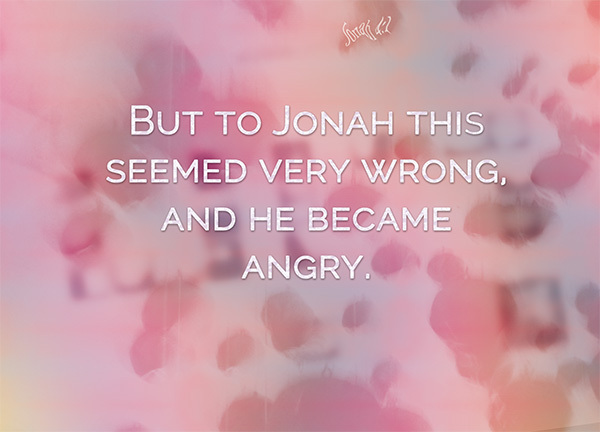 God told him straight, twice, that Jonah had no right to be angry – Is it right for you to be angry? [Jonah 4:4]. It was wrong for him to be angry. He had no right, for God ultimately holds the sovereign right to decide whether to send destruction to Nineveh or not. God decides, not Jonah. God has every right to withdraw his punishment on them, and Jonah has no right to challenge God’s sovereignty. On top of that, instead of being angry, Jonah should instead be rejoicing for the grace and benevolence of God, for the repentance of the Ninevites, an act which gives glory to God. Instead of rejoicing on an act of grace and forgiveness, Jonah is angry for that act of grace and forgiveness. That is wrong, wrong for a prophet like Jonah, who knows God so well that he even knew beforehand that God would show mercy to the Ninevites and ultimately not send them into destruction. Many times we are angry with God’s acts of grace. Why did that vile person get forgiven? He should rot and burn in hell! Okay, I’m dramatising things up, but you get my drift. We are often a little too eager for God to perform his divine justice on our behalf – often more eager than God is. Our God is gracious, and seeks to forgive again and again. His heart is far bigger and wider than ours, and we’re surely a lot pettier than God is. A lot of times, like Jonah, in the face of God’s immense grace we are often left feeling imbalanced – we know we should praise God for his grace, and yet we cannot find it within us to be truly joyful that God has shown grace, as we are unable to reconcile our desire for justice with the grace of God. Jonah was so frustrated that he twice asked to die because of it. Even a man who knew God so, struggled to deal with the grace of God when it is for his enemies. It is not easy. We will struggle too. But let us pray that these little struggles will slowly become better and make our hearts wider and more like God’s, and not accumulate and one day cause a huge emotional strain on ourselves.